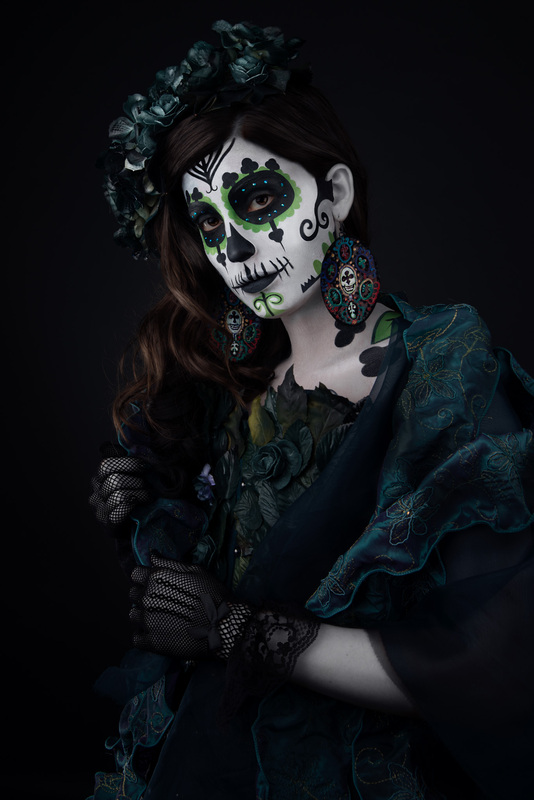 My journey in creating a Dia de los Muertos series. Last year, my long term collaborator Llumina and I met for a cup of coffee at a nearby coffee shop. 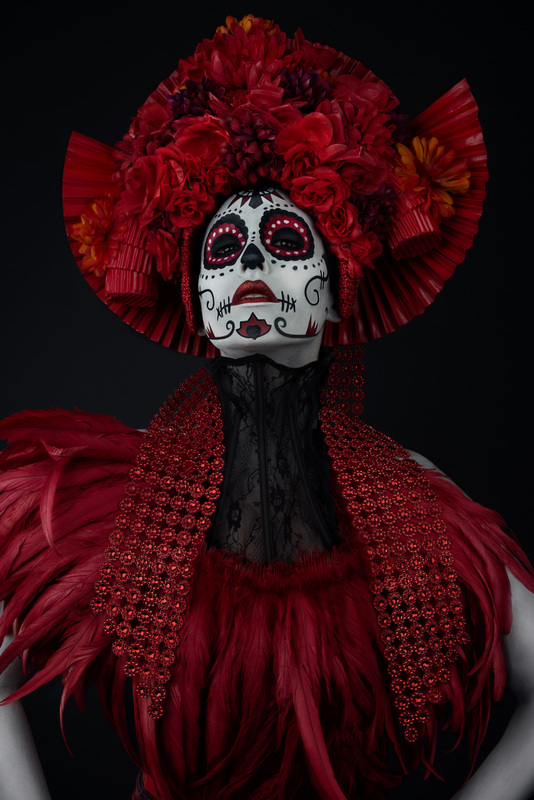 I wanted Llumina to help me create a visual narrative in a concept photo shoot celebrating the Mexican holiday of Dia de los Muertos. Llumina and I have some similar sensibilities in our artistic aesthetic which is dark with a hint (sometimes more than a hint) of gothic undertones. Having spent most of my life in the American Southwest, I have grown up around a culture that celebrates the passing of family and friends. The holiday also celebrates the continuing presence of the spirits of those who have past in our lives. 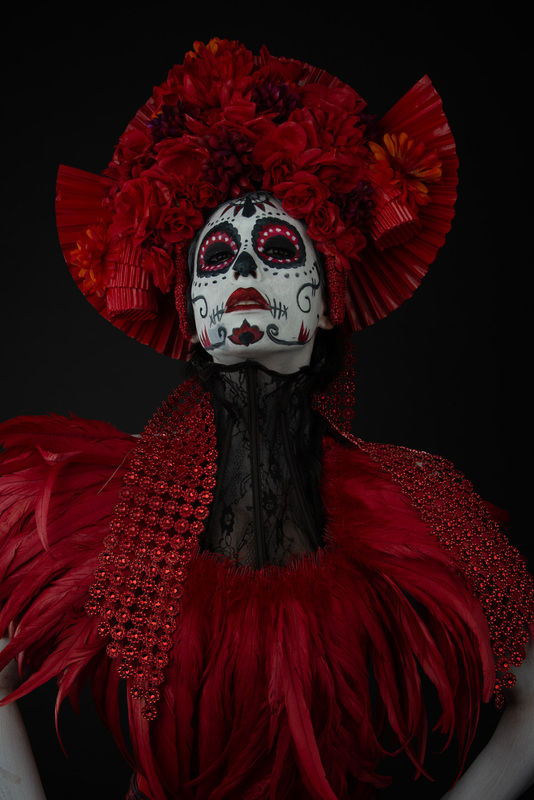 Rituals run deep surrounding the Day of the Dead in Mexico and throughout the Southwest. The Yaqui tribes own celebration of the afterlife in the nearby town of Guadalupe culminates in the Deer Dance during Easter. Check out this article from the Phoenix New Times about the Yaqui ritual, this is a good read to get you started. 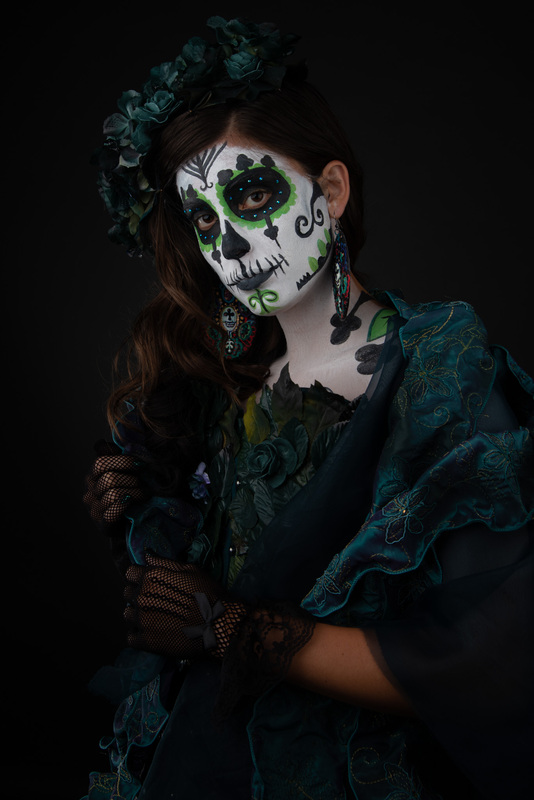 Llumina and I set out to create our own modern interpretation of the Day of the Dead. 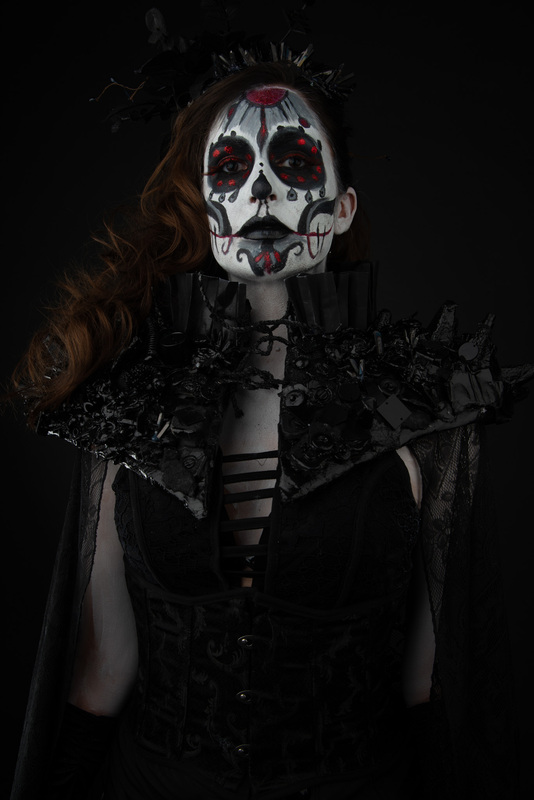 We decided: we would not constrain ourselves to conventional portrayals, the imagery needed to be dark but not frightening, the subjects were not grounded in a certain time period and I definitely wanted the shots to have a gothic feel without being victorian. By mid June Llumina had completed her designs and we met again at a nearby coffee shop. There she spread her drawings on the table while talking through each carefully. I remember Llumina talking, but not hearing much of what she was saying, the images were hypnotizing to me. We talked through aspects that we liked and ideas we wanted to carry through each character. One of Llumina’s inspirations that she drew from were card suites, diamonds, hearts, spades and clubs which in legend, the French suits represent four classes. Diamonds represent the merchants, hearts represent religion, clubs represent the lower class and spades represent the nobility. I visited Llumina’s studio to check on the progress of the wardrobe. Each visit to the studio was a surprise. Llumina had this ability to combine materials into pieces that defied convention. During our visits we also finalized the casting of the roles: Mar d Caos, Sarah Sant, Tondra Dene and Llumina herself would make up the subjects for our photoshoot. 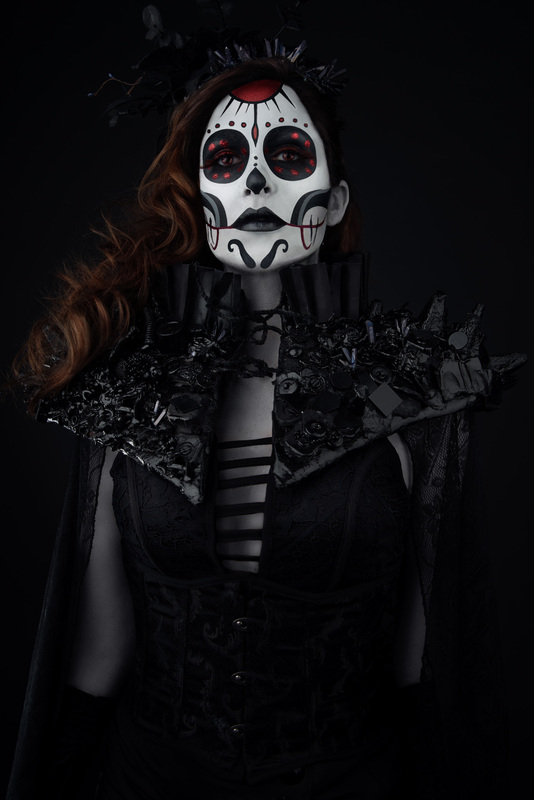 August came around quickly and I assembled our team of experienced makeup artists and production assistants to help make this project come together. DeAndrea Vaughn-Doom and Lydia Harlow would be in charge of the makeup. Andy St Clair, Jeff O’Connor and Chris Mulford would help coordinate the madness the day of the shoot. Here is a link to our behind the scenes gallery of images from that shoot. We shot the set at Parkwood Studio in Phoenix, Arizona in mid-August. The day of the shoot was a complete whirlwind. I know I took some of the BTS images in the gallery, but I cannot tell you which ones I took or which ones DeAndrea or Llumina took, it was just a very crazy day. Juggling four subjects with the extent of makeup we were applying was more than I think any of us could comprehend. Once we had images, it was up to me to complete the vision in post production. For this task I ended up applying Photoshop techniques that I have never used in quite the same way before. I did not innovate a new technique on this project, but I definitely used everything I knew and could find to bring these images to fruition. I typically like to capture everything I can in camera and it became clear that there were challenges that I failed to adequately address on the day of the shoot. 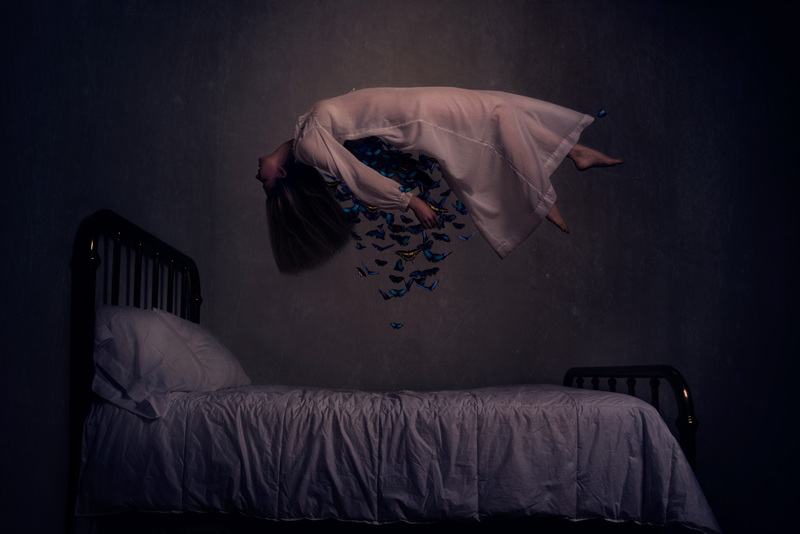 Post on this project became obsessive, in total I spent an exorbitant amount of time realizing the full potential of the final images. It took me 20-40 hours to refine each final image, more time than I had spent on any image in my entire photographic career. Here is a link to the gallery of the final images. These pieces were a labor of love from the beginning of the process to the very end. I have been shooting for over ten years and this shoot was a reminder that images worth creating are never easy and there is always room too keep honing in and improving my craft.